Integrating L2 pronunciation in task-based language teaching: A focus on phonetic form. Training L2 speaking fluency in German through read-aloud tasks. Which language sounds good to you? Individual biases in processing unfamiliar non-native vowel contrasts. Pronunciation Learning through L2-captioned video. Audiovisual articulatory feedback training and its effect on perception across different cognitive profiles: a look at individual differences in second language acquisition. The Relationship between Short-Term Memory and L2 Phonological Acquisition by Spanish/Catalan Learners of English. 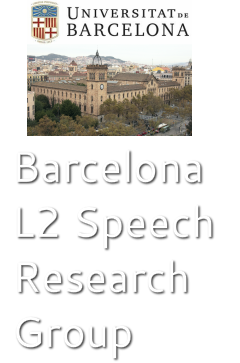 The Effect of Audiovisual and Articulatory Phonetic Training on the Perception and Production of L2 Sounds by Catalan/Spanish Learners of English. Phonological Awareness and Pronunciation in a Second Language. Index of Idiolectal Similitude for the Phonological Module of English applied to Forensic Voice Comparison. L2 Phonological Development in Speech Production during Study Abroad. Musicality and lexical tone learning: Do working memory and attention control play a role? Training L2 vowel perception and production thorugh communicative tasks in adverse listening conditions. Task complexity effects on the acquisition of an L2 vowel contrast: A task-based pronunciation teaching study. Beyond transfer: Re-attunement in L3 speech perception. The role of language dominance and inhibitory control in L3 speech production: VOT asymmetries in language switching. The effects of task type (Focus on Form vs. Focus on Meaning) on perceptual ability, measured by auditory priming. Accent imitation on the L1 as a task to improve L2 pronunciation. Hiring Non-Native Speakers in Barcelona: A Sociolinguistic Study on English-accented Spanish Speech. The Role of Inhibitory Control in Cross-Language Phonetic Interference. The Hidden Effects within Catalan EFL Learners Perceptions and Attitudes to English Language Accents. The role of exposure to Spanish-accented Catalan in the perception of accentedness by Catalan-Spanish bilingual listeners. The role of inhibitory control in L2 speech production: cognate effects on L2 laryngeal timing. Interlanguage speech intelligibility benefit for non-native listeners of English. A study on the effects of nativeness and gender on phonetic convergence in a tape-mediated map task. Mimicry of non-distinctive phonetic properties of L2 sounds as evidence of category formation: VOT and spirantization in the production of oral stops. Time of phonological and orthographical activation in natural silent reading. Investigating the effect of duration manipulation on Spanish/Catalan learners’ perception of English /iù/-/I/ and word-final /s/-/z/. Perception and Production of Two Vowel Contrasts and Voice Onset Time by Catalan/Spanish Learners of English: A Phonetic Training Experiment.